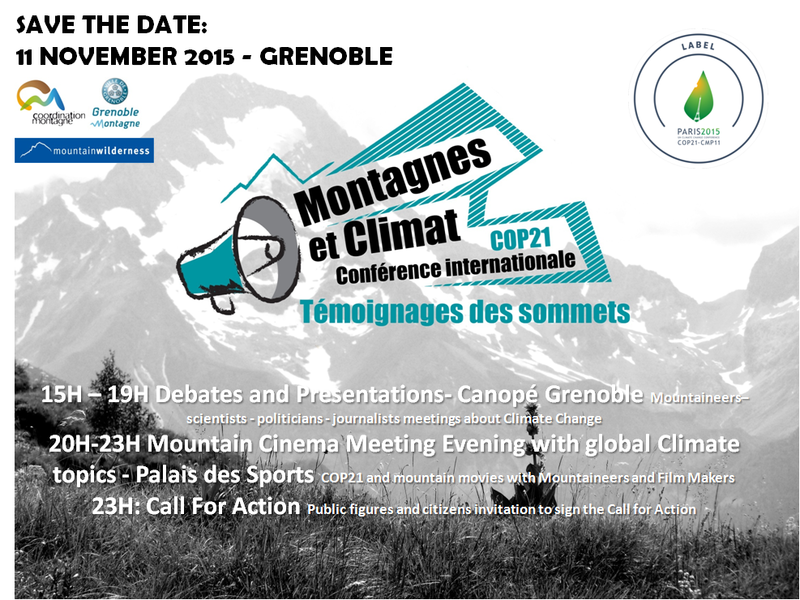 On November 11, 2015, mountaineers and scientists from all over the world will gather in Grenoble, to address global warming issues from the mountains territories perspectives. The “Mountain and Climate International Congress, Testimonials from the Summits” will host climbers, scientists, journalists and politicians for a debate on global warming and its impacts on the mountain environment. Labeled COP21, the conclusions of the conference/congress will be brought forth to the attention of the international community and policy makers of the World Climate Conference. The Mountain and Climate International Conference aims at voicing the mountain communities concerns as they relate to global warming. Observations of the mountains environment, as supported by scientific studies show how much this area is sensitive to changes and how significant their impacts are for our planet as it represents 24% of the emerged land surface (excluding Antarctica), 20% of the total world population, and 60-80% of global freshwater resources. Consistently over many years, similarly to the ocean islands, the mountains are “witness territories” bearing the brunt of climate change impacts. The conference players will be known mountain watchers and actors: mountaineers, scientists, farmers, politicians,… who are witnessing or dealing with climate change in various capacities. They will address the challenge ahead of us: provide a sustainable development of the mountaineous regions in a global warming world.